Are you tired of the facial fuzz and are looking for a good facial hair removal cream? Facial hair can look quite unsightly if they are coarse and dark. Using a facial hair removal cream is a safer option to remove these hairs as compared to waxing and threading. Using facial hair removal creams can be a little tricky as not all cream formulas are safe for the delicate skin of the face. A gentle hair removal cream for the sensitive areas of the face, the Andrea depilatory cream is very soft on the skin and does not cause any rashes or redness after use. It glides evenly and takes just a few minutes to remove all the facial hair from upper lips and chin. It is suitable for all skin types and comes in a very convenient packaging. The price of the cream is affordable and the quantity lasts for 2-3 months if used weekly. The formula is quite gentle and does not cause any redness or burning sensation. The tube packaging is convenient and comes handy while travelling. It only takes a few minutes to remove all the facial hair including coarse hair. It takes a few uses to show results on very coarse and dense hair. People with very sensitive skin can feel a minor sting. This is a great facial hair removal cream for sensitive skin and shows effective results in just 5-6 minutes. The packaging is good and the price is quite affordable. If you are looking for a facial hair removal cream for dry skin, the Avon Skin So Soft cream is a great option to consider as it comes in a pack of four and has a convenient tube packaging. The texture of the cream is smooth and you need to leave it on the facial area for 6-7 minutes to remove hair completely. It also helps to reduce hair growth and coarseness. The price of the cream is reasonable considering the quantity. The cream has a very hydrating texture and cleans hair in just one go. It comes in a pack of four at a reasonable price and with convenient packaging. It does not burn the skin and also retards future hair growth. It is advisable to do a patch test first to check the formula. The cream can cause breakouts and itching if left on the skin for a longer period than advised. This hydrating facial hair removal cream from Avon works best for dry skin and removes hair while controlling future hair growth also. The packaging and the price make it worth a try. Available in two styles for different types of facial hair, the Olay Smooth Hair removal duo comes with a skin soothing balm and a hair removal cream in a tube. This is a two-step process where you apply the balm first and then use the cream to remove facial fuzz. The packaging of the product is very easy to use but the price is very high as compared to other facial hair removal creams available in the market. It is available in two variants for fine and coarse facial hair. The skin protection balm softens the skin so hair removal is painless and faster. The cream applicator makes it easy to apply the product on finer hair. The price of the hair remover duo is very high. You have to carry both the products together to achieve the desired results. This duo softens and prepares the skin for easy hair removal without any pain or irritation. It also works well for sensitive skin and has a pleasant fragrance. With two quantities to choose from, the Nair face cream is formulated using sweet almond oil which makes the skin feel soft and smooth after hair removal. It is suitable for all skin types and is available in two size variants. The cream works well for hair on the surface of the skin as well as ingrown hair. The hair removal process is fast and does not cause any itching or redness. The packaging and the quantity are worth the price and you can also get it at a good discount online. The two size variants make it easier for you to try out the cream. Sweet almond oil helps to prepare the skin for hair removal and softens the pores. It works well on ingrown hair and lightens the hair colour also. It can burn the skin if not removed properly or on time. The cream can feel a bit sticky on the skin. The Nair facial hair removal cream is very gentle on the skin and can be used on even the most sensitive skin types. It softens the hair follicles and makes the process easier and smoother. One of the most affordable hair removal creams in the market, the Gigi hair removal cream comes with a calming balm which soothes the skin after hair removal. This balm is formulated using aloe Vera and cucumber extracts which restore the pH balance of the skin and reduce itching. It has a pleasant fragrance and does not cause any skin discoloration even with regular use. The price of the cream is very affordable. The hair removal cream comes with a calming balm which soothes the skin. The cream has a pleasant fragrance and is suitable for all skin types. The formula can burn the skin and cause rashes if you have a very sensitive skin. The soothing balm does not work well for very stubborn and coarse facial fuzz. It is a very affordable facial hair removal cream for people who have lighter and finer hair. The soothing and calming skin balm is a great addition and works in reducing irritation and itchiness caused due to the hair removal cream. If you are looking for a hair removal cream that comes with an application, this cream from Sally Hansen is a good option to consider. It has a very hydrating formula and is available in two size variants. The cream contains ingredients which are proven to reduce hair growth and thickness and regular use can help you control your facial hair growth easily. It is also dermatologically tested for all skin types. The price of the product is very affordable. The brush applicator makes it easier to get a precise application. The formula is very good for dry skin and gives visible results in minutes. The price of the cream is very affordable and the quantity is good. It doesn’t work effectively on oily skin. The brush applicator takes some time to squeeze the product out of the tube. This cream is very easy to use and can be washed off in minutes after the application. The applicator is very convenient and reduces product wastage also. Formulated with aloe vera, the Surgi facial hair removal cream is well-known for its gentle yet effective formula. It has a very pleasant fragrance and comes with a plastic applicator and an instruction booklet. A skin soothing cream is also included with the pack for calming the skin after hair removal. This cream contains papaya extracts which reduce further hair growth and moisturize the skin. The cream is available in a pack of three and the price is moderate. The cream contains aloe vera and vitamin B to soften the skin before hair removal. It comes with an applicator and a soothing cream which contains hair growth retardants. The cream takes only a few minutes to remove all hair from upper lips and chin. It can cause breakouts if not used properly or if left for too long on the skin. The quantity is a little lesser than other hair removal creams available in the market. Very few facial hair removal creams have such as a gentle formula as this cream and it is very safe and suitable for frequent use. The soothing cream works well in healing the skin and reducing dryness. 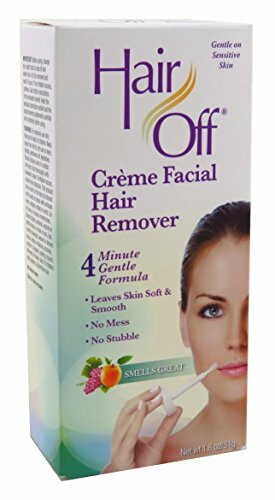 One of the most popular facial hair removal creams available in the market, the Bliss Fuzz Off cream is formulated with willow herb, botanical extracts, and vitamin E. It comes with a fresh scent and has a unique dual-tip applicator. The cream removes all facial hair in just three minutes and comes in a handy and compact packaging. The price of the product is very high as compared to the other creams but you can get it at a great discount online. The dual tip applicator works on both fine hair and coarse facial hair. The cream has a very pleasant scent and contains soothing ingredients. The handy packaging works well for travelling purposes and it takes only three minutes to remove all facial hair. The quantity is a bit less as compared to the price. The price of the cream is very high as compared to other facial hair removal creams. This cream is very popular for its ease of use and effectiveness on light facial fuzz. The dual tip applicator makes it very easy to apply the cream on hard to reach areas. 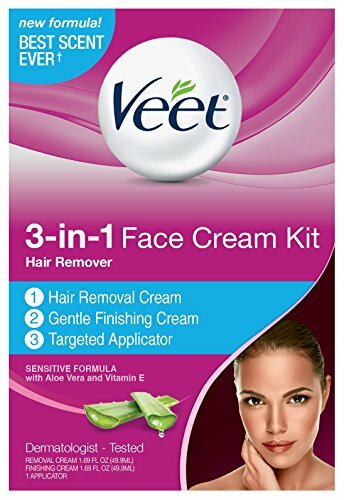 Veet is a well-known brand when it comes to hair removal products and this facial hair removal kit comes with a hair removal cream, a finishing cream, and an applicator. The cream contains vitamin E and aloe vera and has a very pleasant fragrance. It is specially formulated for sensitive skin and is dermatologically tested. The price of the product is affordable and the quantity lasts for 8-10 uses if used on upper lip and chin hair. The hair removal cream and the finishing cream work in softening the pores and soothing the skin. The cream is good for sensitive skin and contains nourishing ingredients. The fragrance of the cream is pleasant and the price is affordable. It does not work effectively on coarse hair. It does not dissolve hair from the root and leaves ingrown hair. This Veet kit is very handy and can also be used for hair removal during travelling. The applicator is very easy to use and makes it convenient to remove the cream after use. Designed for sensitive skin, the Hair Off facial hair removal cream has a hypoallergenic formula and claims to remove your facial fuzz in just four minutes. It comes with an applicator and dissolves hair from the root itself to give you a smoother skin. The ingredients of the cream include chamomile extracts, aloe vera, and vitamin E. It can be used on upper lips, chin, and cheeks also. The price of the cream is higher than other depilatory creams. The chamomile extracts soothe the skin and give a pleasant fragrance. The cream is suitable for upper lips, chin, and cheeks also. It has a hypoallergenic formula and is formulated for sensitive skin. It can take some time to remove thicker hair from the facial skin. The price of the cream is high. This cream is very good for sensitive skin and does not cause any redness or itching. It takes only four minutes to show results and the hypoallergenic formula gives you a smooth skin easily. It is very important to check the formula of the hair removal cream before you apply it on your face. The formula should be gentle and should not irritate the skin or cause itching. Some facial hair removal creams contain aloe vera or moisturizing oil which soothe and soften the skin for making the process easier. Do not go for formulas which are very thick or thin as these formulas can be difficult to apply. Hair removal creams should not be applied by hand so it is always easier to use it if it comes with an applicator. It can either be a tip applicator or a separate plastic applicator which can be used with the cream. Some creams also come with dual applicators which can be used for different types of facial hair. Most depilatory creams can have a very strong fragrance which can irritate sensitive skin. Choose a cream which has a pleasant fragrance and can be used by all skin types without any irritation. You can check the ingredients of the product to gauge the type of fragrance it will have. You can get a good facial hair removal cream in around $5 to $20 but it is advisable to go for creams which are good in terms of quality and are from a reputed brand. Do not buy cheap chemical-based creams as your facial skin is very sensitive and can get permanently damaged by using such creams. You can check the customer reviews of a particular product to get an idea of how well it works and whether it is suitable for you. These reviews also help you to determine the effectiveness of the product and if it is worth the cost. So these are ten of the most effective facial hair removal creams that work well for removing facial fuzz from upper lip and chin easily and safely. These creams are gentle on the skin and do not cause any adverse reactions even if used quite frequently. You can use this detailed buyer guide to choose the right product. Have you used a facial hair removal cream? How was your experience? I wonder is it safe to use hair removal creams for face? It’s safe for your facial skin. Nowadays, there are a lot of brand that produce hair removal cream especially for face which contain gentle ingredients with effective performance. So, hair removal creams for face don’t burn your facial skin. I suggest you to read the label if it’s for face or body before buying. I bought a hair removal cream and I wonder what should I apply on my face after using hair removal cream? There are some chemical irritation ingredients in hair removal cream. So, you should not leave hair removal cream for so long time, just quickly remove. After that apply a cold washcloth. Moreover, you should apply hydrocortisone ointment 1% to reduce the redness as well. Gigi Hair Removal Cream for The Face works well.